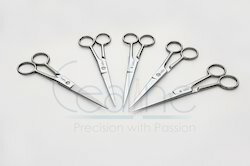 6" (000) iron steel polish scissor specially designed for hair cutting. Use: In Various Tailoring And Cutting Purposes. 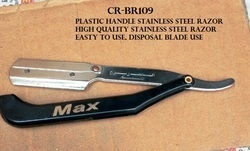 We are among the reputed organizations, deeply engaged in offering an optimum quality range of SSBarber Scissor. Black Cotin Barber Scissors 6"
Rubber grip handle black coated blade: 6"&7"
Symbolic to all the success we have acquired in the industry, remains our status as a prominent enterprise engaged in offering SS Plastic Handle Scissor.